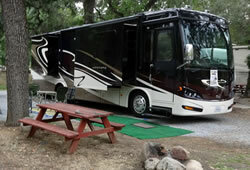 Nestled in the Sierra Nevada foothills only 8 miles from the entrance of Sequoia National Park Sequoia RV Ranch offers fun and relaxing camping in a breathtaking natural setting. Open year-round, the ranch offers spacious and secluded campsites, many of which are positioned along the picturesque Kaweah River. Along with the hiking, biking, rafting, and expansive wildlife found at Sequoia National Park, a spring-fed swimming hole and a fishing hole are located on site, and nearby Kaweah Lake boasts excellent boating and water-skiing as well. The quaint village of Three Rivers is only minutes away, and the Tulare County seat of Visalia is within 30 miles. Both cities offer a variety of cultural attractions, artisans, restaurants, and seasonal events. Full hook ups on the River! Open your windows and listen to the sounds of the river! 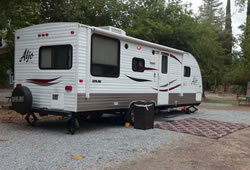 Spacious, full hook-up sites located in the lower and upper loops of the campground. 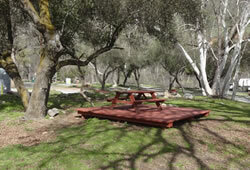 Beautiful sites along Sycamore Lane feature firepits, picnic tables and individual grassy areas. 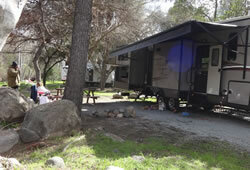 With huge oak trees providing lots of shade, these sites accommodate RVs as well as tent campers.